Western countries have long suspected that Iran is pursuing nuclear weapons while the Iranian government denies that accusation and insists on its right to use nuclear technology for peaceful purposes. In November, the two sides reached an interim agreement under which Iran constrains its nuclear program in return for a modest easing of sanctions — a deal that began to take effect on January 20th. Long-held mistrust between the U.S. and Iran, however, threatens to undermine the temporary arrangement and, possibly, a long-term agreement. What should the U.S. ask for in the final deal? What tack should western negotiators take to improve the likelihood of success? How can each side improve confidence in the other’s commitment to follow through? What is the role of the IAEA? 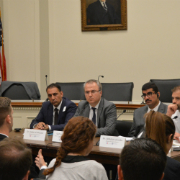 On February 7th, PSA held a bipartisan discussion with two former U.S. negotiators on Iran to gain valuable insights on these questions and what is in store for the future relationship between the U.S. and Iran, as well as its neighbors in the region. Nicholas Burns has a distinguished career in government and the Foreign Service, including Undersecretary of State for Political Affairs (2005 – 2008) and lead United States negotiator on Iran’s nuclear program. Based on his experiences in this position, Mr. Burns will be able to provide a first-hand account of formulating Iran policy and establishment of UN and U.S sanctions regimes. He is Professor of the Practice of Diplomacy and Politics at the Harvard Kennedy School of Government. Robert Einhorn is a senior fellow with the Arms Control and Non-Proliferation Initiative and the Center for 21st Century Security and Intelligence, both housed within the Foreign Policy program at Brookings. Einhorn focuses on arms control (U.S.-Russia and multilateral), nonproliferation and regional security issues (including Iran, the greater Middle East, South Asia, and Northeast Asia), and U.S. nuclear weapons policies and programs.